Preheat the oven to 350 degrees F (175 degrees C). Spray a baking dish with cooking spray. 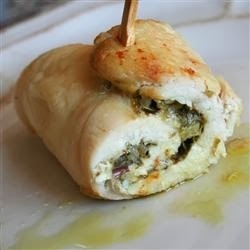 Spread 2 to 3 tablespoons of the pesto sauce onto each flattened chicken breast. Place one slice of cheese over the pesto. Roll up tightly, and secure with toothpicks. Place in a lightly greased baking dish. Bake uncovered for 45 to 50 minutes in the preheated oven, until chicken is nicely browned and juices run clear.